As 2015 is coming to an end, the time has come for us to honor the coolest gadgets of the year. On Thursday, we kicked off our PhoneArena Awards series by naming our favorite smartwatch, and today, we'll reveal the most impressive tablet we got to handle in 2015. Can you guess what it is? Yup, the Microsoft Surface Pro 4 is the best tablet we got to try in 2015. That's partially because there weren't all that many outstanding tablets released in 2015, but also because Microsoft's offering is packed with technology making it worthy of its steep price. That includes a large, gorgeous display, solid and sturdy construction, a convenient kickstand, and a last-generation Intel processor paired with plenty of RAM and storage. The latter hardware setup allows the Surface Pro 4 to run a huge portion of the Windows software catalog – from not-too-demanding 3D games and desktop-class web browsers to graphics editors and office suites. In fact, Microsoft claims that the Surface Pro 4 can replace a laptop, and to many a Windows user, that might very well be the case. After outfitting the tablet with a keyboard, that is. Simply put, the Microsoft Surface Pro 4 is not a tablet to be underestimated. Oct 06, 2015, 10:23 PM, by John V.
In September, the rumors came true: Apple released a larger iPad. And it is not a bad tablet at all. In fact, its design, processing power, and software arsenal put it among the best, most exciting tablets money can buy right now. Sure, the iPad Pro is not exactly a product for the masses. It is more of a niche, professional-grade device. Its size puts it among the largest tablets around, and its price puts it among the most expensive, much like the case is with the Surface Pro 4. But considering what it is made for – to be a canvas for digital artists, a display for professionals to show off their projects on, and a high-end entertainment device – the iPad Pro gets the job done really well. If only its price was easier to swallow. Nov 19, 2015, 9:30 AM, by John V.
While yes it is a hybrid, it is still a tablet first. You cannot blame MS for Android and Apple lacking putting a full x86 OS into their versions. Google could certainly throw a x86 Linux distro in there that isn't dependent on their java VM and compete against windows OS, but they don't. I'm quite surprised indeed.. Although we all know that the sp4 is the best tablet out there right now, I was skeptical whether PA would actually acknowledge that.. Now I feel PA ain't as biased as it used to be. Faith in humanity restored.. I never felt they where biased... The obviously have more knowledge and experience than any of us, so whatever their choice is maybe based on something we don't see or have not experienced. For example, many people are here saying the ipad pro does not deserve the runners up position probably more than the samsung tab 3, but these same people had not use neither of the devices for even up to a week. 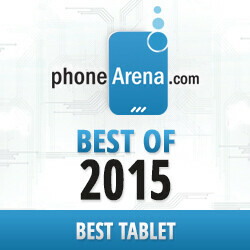 So how did they know PA is being biased by calling ipad pro the second best tablet this year? We all have personal experiences, thought and feelings on these devices some times tho, but it does not always mean they are right. For example, I feel its completely no meaning in buying an android tablet. Android on tablet is completely useless. But if I came here and I saw an android tablet as number 1, would I call PA biased? NO. Thank God Android is even not there! And I ment tab s2 not tab 3. In every article they have to mention apple even if it's as a runner up. Android has a majority in both tablet and smart watch market. Best according to phonearena, which means nothing. Surface pro on the other hand deserved it. For years the tablets have been oversized phones. Surface made it something that can do everything. I was playing steam games on my surface. "Best according to phonearena, which means nothing" Then why do you stick around for more than a year and a half, with nearly 700 posts so far? I do not agree with everything PA says, but that's because I know my points are subjective based on my experiences and my needs, NOT majority or someone who actually has used nearly all devices on hand at least as a trial or experiment. If I had the cash for either SP4 or iPad Pro, I'd get the iPad Pro: 1. I use iOS devices so interoperatability would be a breeze, 2. I like iOS devices more than windows devices, 3. I love to draw, and after trying everything from 3rd party stylus', Note 4 (which is exceptionally good) and The Pencil - I love the Pencil more by a huge margin, but that should not matter to you - it's subjective. I wouldnt complain if PA chooses S-Pen to be best, though. Because we are narcissist duh...because a sight can be great for news, kinda like a news feed. That doesn't mean you have to agree with the author or the site. Make sense? Yes, absolutely. If your product isn't picked as the best in it's category, you're done. That's why there's only two products in every consumer category - best and runner up. With a username based on a shameless thief and a company of shameless thieves, I shouldn't wonder that you'd be an asshat. They tried to force devs to hand over licensing when they went public. They're also known to take the work of others, strip their credits and put their own into the headers with minimal to no changes. You could never 'steal' anything from android. Considering android is 'free'. If you put the work into making a custom ROM you can take credit. If not...the list of credits would be a mile long...aint nobody gonna do that. Does Google give credit for all the code they were given? Because looking at their screen I don't see it. I wouldn't think of surface as an tablet due to its thickness and weight. Its a great ultra portable. My dell 7140 is a great windows device but i don't use it as a tablet due to its weight and handling. Every one experience and usage is different. Saying surface could fit every need is just stupid and limiting. 1.6lbs and 1/3rd of an inch thick...is to big for a tablet seriously? The iPad Pro is better in almost every way, why would you give it to the Air 2? I own an Air 2, and absolutely love it, but let's be honest. Price wise the Pro is somewhat of a fail, but if one isn't worried about price, then it's the superior device by quite a margin. Dark your one of the members here that I knew that will not be biased. Come one man iPad pro? Best tablet. They revolutionized tablet that I give them credit. I agree with dark. Its because everyone definition of a tablet is different and we use it differently. When i think of tablet i think about surfing PA site, youtube and watch movie. I never think about editing with photoshop or typing on my microsoft Office so why do i want to carry a surface pro into bed. An iPad thinner and lighter weight would work to its advantages. For me, i would pick my Tab S 8.4 over my Dell 7140 or Samsung Note Pro 12.2 if i just want to read an ebook or make a PA comments. So depending on the task that need done i pick my go to device accordingly. Good post yo. Tablets are very diverse, and the smaller lighter ones can be the most useful, just due to their size. I'm feeling the iPad Pro, but I doubt I would have it outside a lot, nor would I hold it over my face while lying in bed lol. It has its uses, but it won't be as mainstream as a smaller one.